In my list of things to worry about as a parent, Halloween doesn't appear at all. I remember the excitement and sugar highs of my childhood, but that was followed by quite literally decades of indifference. However this holiday does expose the weakness of downtown parentage, the lack of a critical mass of kids. 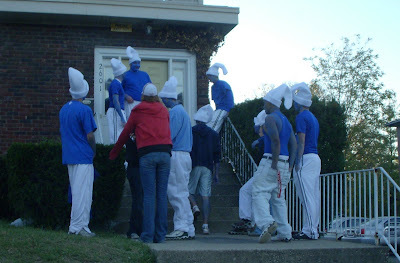 I know that in the past the folks in the Prospect Hill historic district have tried to have some festivities, but I never made it to them, and have heard nothing about them this year. So, if I limited myself to the neighborhood my son would be dressed up with no place to go. And that would be a true shame to the world at large, dressed in his penguin outfit (yes... I have become one of those parents). Our solution is simple. One of our long-time friends has invited us year after year (well at least my wife, I have tagged along intermittently) to her neighborhood for trick or treating. It has become a tradition; we bring the Graeter's Pumpkin Ice Cream and Bittersweet, and she supplies the cute kids. Well for the second year, we are bringing a bonus cute kid. It is also great because it is the same 'burb my parents and sister live in, so we get to make the Grandparents and Aunt happy. So I am curious, what do other City parents do for Halloween? OK, I know the picture doesn't totally match, but it was the best Halloween-themed picture I have. 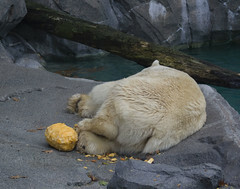 It's what happens when a Polar Bear meets a pumpkin at Hallzooween. America has been living in a dream world for the past few years, losing its basic values of thrift and prudence and living far beyond its means, even as it has lectured the rest of the world to follow its model. At a time when the U.S. government has just nationalized a good part of the banking sector, we need to rethink a lot of the Reaganite verities of the past generation regarding taxes and regulation. Important as they were back in the 1980s and ’90s, they just won’t cut it for the period we are now entering. I signed up to contribute to this blog. I thought I might start with a little background. I am a father of a 17-month old. We have lived in the city for a long time. Before moving to Mt. Auburn, we lived for about a decade in Mt. Lookout. When we moved here a little over three years ago I think everyone closed the "will they ever have a kid" book on us. I joke that I waited until we moved here so that our announcement would be a total surprise, but that is actually not true. We moved here with no intention of raising kids in the city. But it really wasn't until we moved here that we felt ready. There are more factors than just location, but I won't bore you with that. What I want to focus on is our mindset on deciding to raise our family in the city. I appreciated finding this blog. A nearby friend with a kid (now two kids) sent me the link. I like hearing about other folks bucking the trend to head to the suburbs. We have had a few friends and family ask us if we planned on moving when my son gets to school age, but most folks already knew the answer. We are huge fans of our neighborhood, and well, let's just say my personal mantra is "everyone's entitled to an opinion... specifically mine." 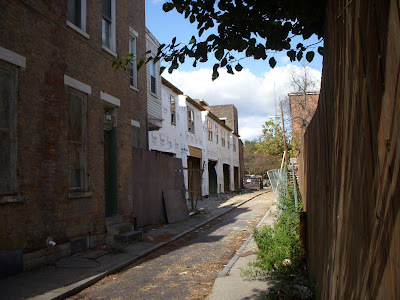 So, assuming Mike does not realize what a terrible, terrible mistake he made giving me access, I think that will tend to be the theme of my posts... what is good about raising your family in the city. To be clear, I don't feel especially "brave" or "cutting edge" in my choice. I'm not really sure what a "hipster" parent is, but I'm pretty certain I am not one. We're just a regular family of three, who have found our dream home to raise a family. It's a 130-year old Italianate on a small parcel in the city, rather than a 2-story home on a large lot in the suburbs. There are definitely challenges in our choice, but there are challenges in all choices. We have never regretted our choice, and I look forward to sharing what little I can about the city. Who knows, maybe it will help someone come to the right decision. And to be clear, that may not be the city for them, but it is for us. Another downtown parent has joined this blog! Welcome Bsherm and see his first post above. UPDATE: I moved this to the top of the blog because I have some interesting people writing in on the comments section. Check it out. 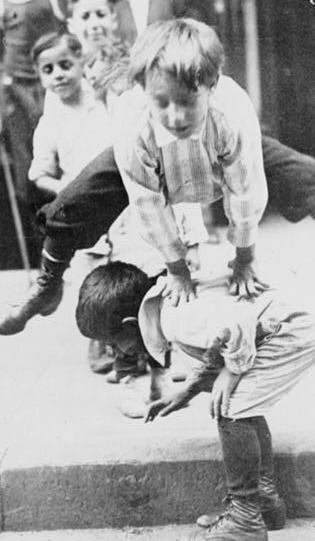 Interesting article about a movement called unschooling. I like a lot about it. The best classroom is experience outdoors in the real world. I just don't know who has the time or can afford to stay home from work to spend 12 years home with their kids. I've heard about this movement before, but it seems to be gaining more widespread acceptance. Here is the Babble article on Unschooling. ...unschoolers don't send their kids to regular school and avoid teaching by curriculum. You won't find them at the kitchen table every morning doing math, then reading, then geography." ...unschoolers believe in letting a kid's curiosity, interests and natural hunger for knowledge guide their learning. Park and Vine is hosting an exhibit of historic building photos. Our neighbors from Visual Lingual, will be at the Cincinnati Art Museum this Saturday as part of Family First Saturday. "We'll have lots of work to show, including a sneak peek at a couple of brand-new projects that we just finished. We'll be answering questions about our work and process, and generally trying not to trip over our words. It's a kid-friendly event, but grown-ups are welcome, too. Plus, it's free! We will be unrolling new products within the next couple of weeks and participating in some special events during the coming holiday season. As a side note, fellow Cincinnati designer Jenny Sauer of Three Sheets 2 the Wind is having a trunk show/sample sale this weekend, which is also worth checking out." This new construction in Over the Rhine is very exciting. 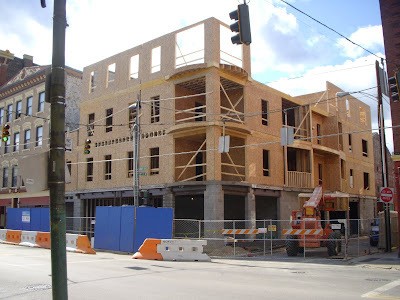 It is so strange to see new wood framing in the Washington Park area. Both projects are at about the same rough framing stage and are showing lots of promise. Enjoy. 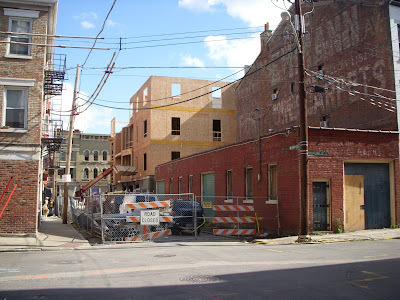 First is the new construction on Pleasant Street by OTR Community Housing. 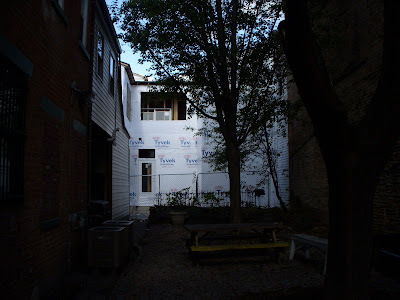 In the photo are the 5 new townhouses, but the project also includes the rehab of several buildings. I love this new view of Pleasant Street taking shape! Previous posts on this project: Demo and Foundations. Next is a condo project by The Model Group. This has first a concrete first floor commercial space, with wood-framed residential above. Previous Post showing demolition of previous buildings on this site. First Concrete and rendering. Progress photo from August. Ta-Nehisi Coates continues to amaze me. He has beautiful insights in each post. Today, wrapping up Mad Men, the 80's Crack Epidemic and the Justice League ...and it all makes sense. "McCain's views are closer to mine than Obama's. But I've learned over this Bush era to value competence along with ideology. Otherwise, our ideology gets discredited, as it has so disastrously over the past eight years. ... I concluded that McCain would not -- could not -- be a good president. 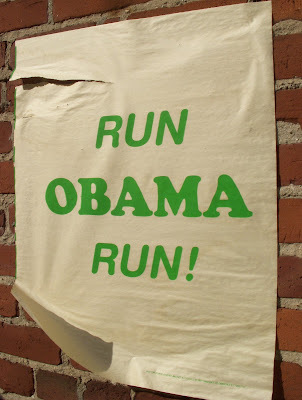 Obama just might be. Is Palin going anti-McCain? 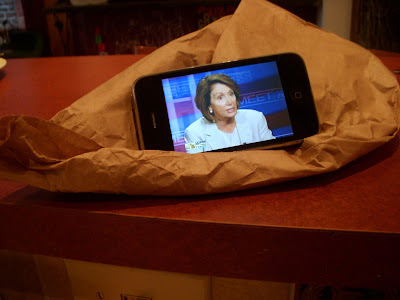 Why was Palin in Iowa today, when all the polls show Obama up there 53 to McCain's 41? Is she thinking about the next campaign? When housing starts begin again, should we continue on the same model? ...For a half-century we've watched the suburban sprawl machine ... with little regard for aesthetics, for the rising cost of energy or, for that matter, the cost of leaving the region's have-nots behind in older, have-not communities. ....maybe, it's time to revisit the inevitability of suburban sprawl. ...If the federal government can use our tax dollars to bolster private banks, why can't states, counties and towns require private developers to include some energy efficiency, transit access, walkways and just plain common sense? Over the last half-century our metropolitan region has roughly doubled in size—as measured by the amount of land we sprawl across—while our population has grown barely 20 percent. Where's the sense in that? ...main growth sectors will be: 1) senior citizens and 2) immigrants of limited means. Seniors will want to live closer to shops and services. Immigrants will want to live affordably and near their jobs. Neither will have much use for drywall palaces along the suburban fringe. "It's time...to start planning what the future should be." Traditional urban townhouses are in demand, even in this dismal housing market. But architects continue to be disdainful. They have not been trained to design them and they learn in school that respect is earned by breaking precedent, not learning from it. See for an example of this the comments on a thread about new townhouses in NYC by Robert AM Stern. 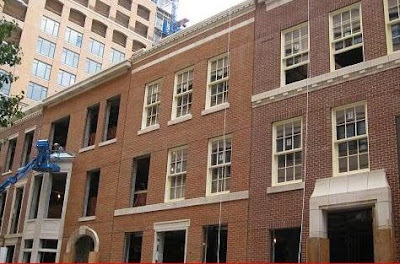 Stern is one of the best architects in the country, but as photos of his project are posted, readers of Curbed chime in with comments about how "fake" they are etc. My impression is that most of the readers of Curbed are architects and designers. 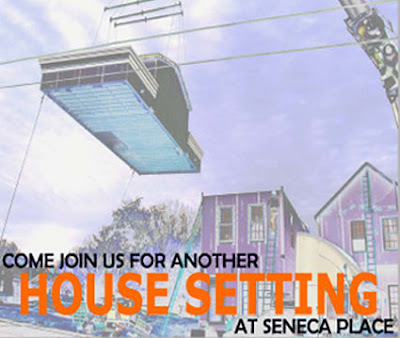 Of course these townhouses will sell like hotcakes, just like the Seneca Place posted below have been presold. 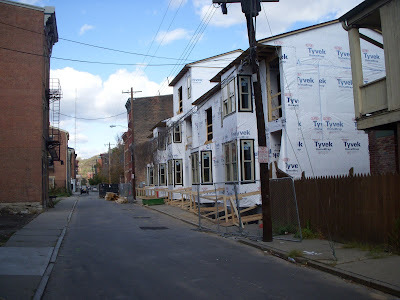 Modern infill projects in Cincinnati that are having trouble selling should take notice. The Center for Great Neighborhoods of Covington and Huff Realty are proud to announce two new homes (both of which are sold) are being constructed as part of the Seneca Place development in Covington. We are also excited to announce the 3-story row house, at 520 Thomas will be the first L.E.E.D. GOLD-certified home in Kentucky. The Center for Great Neighborhoods of Covington, with support from The City of Covington, continues to bring cutting edge housing development to Northern Kentucky. The two new homes will have a panelized foundation by Superior Walls. The Energy Star modular homes will be constructed by Phoenix Building Solutions using the newest technology in building science. These homes will demonstrate that “Green” construction is not only good for the environment, but can also be affordable for homebuyers. Previous posts on Seneca Place here and here. I missed the last house setting, but hope to make it to this one November 5th, 9-5 with a presentation at 10am. ...portfolios ..and other forms of assessments that may be a little bit more expensive ...are allowing us to make sure children are getting the proper analytic kinds of tools. ...we're talking about tests that require children to assess their entire year ... to put together through writing and through speaking...we're looking at language skills as well as writing skills to get a sense of how well they've learned their lessons. Disney first released this picture in 1946, and there was some racial controversy about it even then. The NAACP acknowledged "the remarkable artistic merit" of the film, but decried the supposed "impression it gives of an idyllic master-slave relationship" (even though the film was set after the American Civil War). 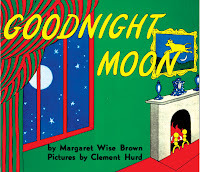 It was shown on television in 1972 and in theatres in 1986. Other than that, Disney has never released it on home video in the USA because executives believe it might be construed as racially insensitive. It had previously been released on home video in England and Japan, but was withdrawn worldwide in 2001. Bootleg copies are widely circulated, and to their credit, the Disney Corporation has not brought legal action. Based on the Uncle Remus cycle of stories by Joel Chandler Harris, it was Walt Disney's first live-action film, though it also contains major segments of animation. The live actors provide a sentimental framework, in which Uncle Remus relates the folk tales of the adventures of Br'er Rabbit and his friends. Maurice Rapf was asked by the Walt Disney Company to turn the stories into a shootable screenplay. 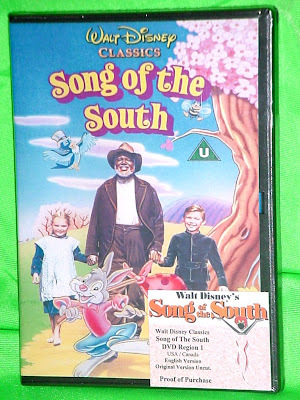 One of the reasons Disney hired Rapf to was to temper what Disney feared would be a white Southern slant. Rapf was a minority, a Jew, and an outspoken left-winger, and he feared that the film would inevitably be Uncle Tomish. "That's exactly why I want you to work on it," Walt told him, "because I know that you don't think I should make the movie. You're against Uncle Tomism, and you're a radical." Rapf initially hesitated, but when he found out that most of the film would be live-action and that he could make extensive changes, he accepted the offer. We went to the new Crepes place on Court Street, and I cannot recommend it highly enough. Yum. ...it could use a better holder to prop it up. Palin had a very strong anti-zoning stance in her career in Wasilla. KuyaMatt is an ice cream junkie. He would live on the stuff if he could. Sometimes on vacation I'll call "ice cream for dinner night" and take the family to DQ or A&W. Everyone else gets food first; he and I are the only ones who enjoy a purely frozen feast. AdamBomb likes it too, but he's not in love. Both were also blessed with artistic talent. They draw for fun and come up with some impressive stuff. KuyaMatt got a ribbon at the Hyde Park art show years ago. AdamBomb won a free ice cream in a Graeter's picture contest. In summer 2007 both high-schoolers flirted with getting summer jobs. 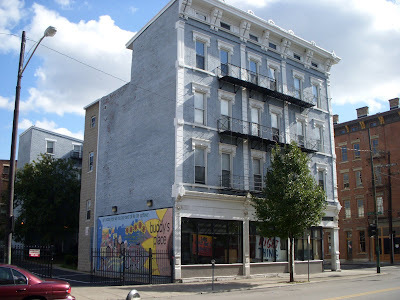 KuyaMatt applied at the Graeter's a block and half from home, and both applied to Artworks. KuyaMatt, going through a period of procrastination, applied too late and didn't get either one. AdamBomb landed the Artworks gig, but had to decline due to schedule conflict with a study skills course we already paid for. Coming into Summer 2008 their planning was much better. The Artworks application made the deadline, this time including a full color portfolio. The Graeter's application was submitted plenty early, this time with some networking and key recommendations to back it up. And they each got what they aimed for. Only now it's KuyaMatt that wound up at Artworks, and AdamBomb who works at Graeter's. How's a poor parent supposed to keep all this straight? Here is an editorial from a Conservative Ohio group that argues that stonger chemicals should be allowed to be used to combat bedbugs. They are a growing problem in Cincinnati and I have been wondering why we don't have better pesticides at our disposal. Too bad this article is just an opinion with no facts or links. There are several good websites and blogs out there about how to defeat bedbugs. None that I read thought that DDT was a good idea. Apparently some bedbugs have developed resistance to DDT anyway. Also: Saw an article about a dog that can sniff-out the hard-to-find critters. Another Yma Sumac record. Weird stuff. I'd like to digitize samples of these and post them with the albums, but I don't have that technology yet. Part of the reason this crisis occurred is that everyone was living beyond their means – from Wall Street to Washington to even some on Main Street. CEOs got greedy. Politicians spent money they didn't have. Lenders tricked people into buying home they couldn't afford and some folks knew they couldn't afford them and bought them anyway. We've lived through an era of easy money, in which we were allowed and even encouraged to spend without limits; to borrow instead of save. Now, I know that in an age of declining wages and skyrocketing costs, for many folks this was not a choice but a necessity. People have been forced to turn to credit cards and home equity loans to keep up, just like our government has borrowed from China and other creditors to help pay its bills. But we now know how dangerous that can be. Once we get past the present emergency, which requires immediate new investments, we have to break that cycle of debt. Our long-term future requires that we do what's necessary to scale down our deficits, grow wages and encourage personal savings again.